The Philippine Superliga has aleardy started and so far, it has received a lot of viewership and praises from the solid Volleyball Fans in the Philippines. That's a strong testament that Philippine Volleyball is slowly reaching its Golden Age. Commissioner Dr. Ian Laurel really did a great job in organizing this first ever professional volleyball league in the Philippines. The opening festivities and the first two games of the league manifested the bright future of the league under the leadership of Commissioner Ian. Some of the officers of the Philippine Sports Commission were present during the opening festivities. One of them even said that the Philippine Superliga will serve as a haven for college volleyball superstars who have already graduated from their universities, that they could pursue a more rewarding volleyball career. He also pointed out that the league could serve as a springboard to forming a more formidable Philippine Women's Volleyball Team that can possibly reclaim the lost glory of Philippines in the word of Asian Volleyball. I spoke about the fans in the opening paragraph. The teams in the Philippine Superliga have their own respective fanbases primarily because each of the squads have their own set pf superstars that attract so much attention. In line with that, if you're an avid fan of one the competing teams in the Philippine Superliga you should know the league's schedule of games. So here it is. 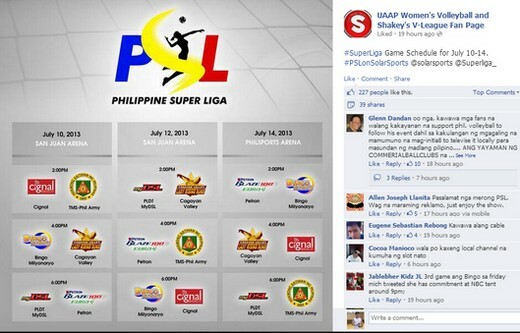 Philippine Super Liga Semifinals Schedule: July 26, 2013: Philippine Army vs. Cagayan Valley Game 1 5PM at SM Mall of Asia Arena ; Cignal vs. Petron 7PM also at SM Mall of Asia Arena. Delayed telecast on Solar Sports starts at 7PM. wala pa po bang schedule for next week? hpefully merun npoh sched para ma singit ko s schedule ko po to watch live s super liga tnx..
kailan poh ipapakita sched ng aug?